Save Me the Plums: My Gourmet Memoir. 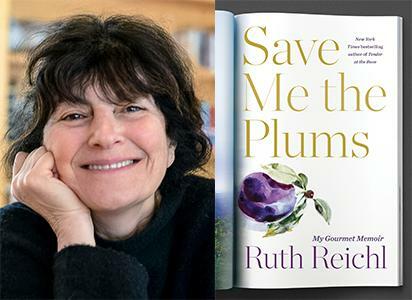 Ruth Reichl is the Bestselling Author of the Memoirs Tender at the Bone, Comfort Me with Apples, Garlic and Sapphires, and For You Mom, Finally; the Novel Delicious! ; and, most recently, the Cookbook My Kitchen Year. She was Editor in Chief of Gourmet Magazine for 10 Years. Previously she was the Restaurant Critic for The New York Times and served as the Food Editor and Restaurant Critic for The Los Angeles Times. She has been honored with 6 James Beard Awards for her Journalism, Magazine Feature Writing, and Criticism. She lives in upstate New York with her husband and two cats. This was the golden age of print media—the last spendthrift gasp before the Internet turned the Magazine world upside down. Complete with Recipes,Save Me the Plums is a personal journey of a woman coming to terms with being in charge and making a mark, following a passion and holding on to her dreams—even when she ends up in a place she never expected to be.